James Cameron's 15 years-in-the-making, reputed $500 million, 3D action adventure lives up to the hype, thanks to extraordinary visual effects and thrilling action scenes but it's also a good 30 minutes too long, the dialogue is functional at best and the plot goes a little overboard on the New Age-y tree-hugging aspects of the story. Directed by James Cameron, Avatar stars Sam Worthington as Jake Sully, a wheelchair-bound Marine who has his consciousness implanted in a 10-foot-tall, blue-skinned Avatar in order to infiltrate the natives of the planet Pandora, known as the Na'vi. The military, led by hawkish, trigger-happy Col. Miles Quaritch (Stephen Lang) are anxious to get their hands on the planet's rich supplies of a mineral known as unobtanium but the Avatar Program's director Dr. Grace Augustine (Sigourney Weaver) convinces them to let Jake try and infiltrate the Na'vi and gain their trust, hoping to find a peaceful solution. However, Jake gets more than he bargained for when he meets and falls for Neytiri (Zoe Saldana), a beautiful warrior princess, who teaches him the tree-stroking ways of the Na'vi and shows him how to ride a Banshee. And when the military decide they've waited long enough and decide to start a war, Jake finds himself siding with the natives. First things first, the rumours about Avatar changing the future of cinema are all true; the performance capture, CGI and 3D effects are extraordinary, creating a thoroughly immersive experience that is unlike anything you've ever seen before. On top of that, the visuals are stunningly beautiful, so that even when the plot slows to a crawl, you're still gaping in wide-eyed wonder at the gorgeous surroundings, almost as if you were actually on Pandora yourself. The plot is essentially Pocahontas in Space and both the dialogue and acting are functional at best, if occasionally cliched and caricatured – there's also a little too much tree-hugging than is strictly necessary, as if Cameron was forcing you to read his favourite eco-friendly fantasy novels (clearly he's a big fan of Ferngully: The Last Rainforest) before the action starts. Fortunately, the action sequences are genuinely thrilling and more than compensate for the slower moments. 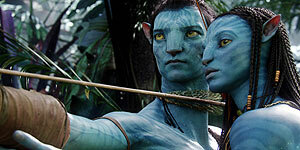 Despite a few flaws, Avatar is an extraordinary experience that more than lives up to the hype. Highly recommended.